Current Facebook Status: is thankful for doctors [and PNPs Bobbie Boyd!] who know what they’re doing. Three years ago on the day before Thanksgiving, Christopher has what was likely life saving surgery. So very thankful he is so healthy today! Currently Playing In The Background: Special Agent Oso – Playhouse Disney. Shocking. Yeah – so I can’t keep track of volumes, so going with something else ;). I’m posting three reviews throughout the day today – all three of Erynn Mangum’s Lauren Holbrook series. They’re not real in depth reviews but hopefully enough to get a sense of them. Tomorrow, I’ll review her Maya Davis series – book 3 was a free influencer copy ;). Lauren Holbrook has found her life’s calling: matchmaking for the romantically challenged. And with the eclectic cast of characters in her world, there’s tons of potential to play “connect the friends.” Inspired by the recent success of matching her sister and new husband, Lauren sets out to introduce Nick, her carefree singles’ pastor, to Ruby, her neurotic coworker who plans every second of every day. What could possibly go wrong? Just about everything. When Lauren’s foolproof plan begins to unravel, she learns that a simple introduction between friends can bring about complicated results. And as she reconsiders her new role as Cupid (as well as her vow to stay single forever), will Lauren finally decide that God’s plan is always good enough? Her cast of fellow employees and friends – I liked all of them from her quirky coworkers and best friend of a boss to Ryan to her sisters and their families – and her overprotective Dad of course :). Even the more difficult customers came around. That’s always nice :). Miss Match is a fun, easy read – a chick lit, rom com book. Lauren is, overall, secure in her faith and that comes through. Movie quotes are great, but Bible verses abound as well. 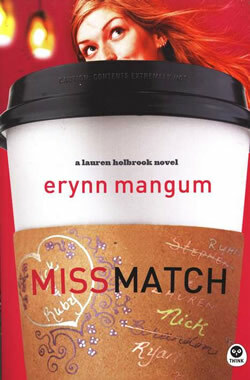 This was my first Erynn Mangum book but won’t be my last :). 8.5 out of 10 stars. Watch for the other two Reviews later today :).